Tattoo designs are as varied today as the people who wear them. While people once thought tattoo appreciation was limited to the likes of sailors and bikers, they likewise thought tattoo designs were limited to anchors, hearts and the occasional mermaid which would "dance" at the twitch of a bicep. Neither of these are true any longer. The aforementioned hearts, anchors and mermaid motifs may well be considered traditional tattoo designs because they are exactly the sort of images people have associated with tattoos in our culture for a number of years. Religious images such as crosses and Sacred Hearts are also very familiar and quite traditional.The tattoo designs of today transcend tradition, however, as there are more talented tattoo artists working today than ever before and more people from different walks of life getting tattoos. More tattoo recipients and more artists translates easily into more tattoo designs. Previously unheard of, today it is common for tattoo artists to offer popular cartoon characters as a tattoo design. Looney Toons characters such as Bugs Bunny and Daffy Duck are especially popular, as are Disney creations like Mickey Mouse, Goofy and Tinkerbell. Of course these characters are all copyrighted and/or trademarked by their respective owners, making it technically illegal for the tattoo artist to apply them unless they have permission (usually in the form of licensing) from the owner of the copyright. So, you can't always just walk into a tattoo shop and ask the artist to give you a Speedy Gonzales or Heckle & Jeckell on your tush. Then again, it all depends on how worried the artist is that he might get into trouble. The FBI is probably a little too busy to be monitoring every tattoo parlor for copyright infringement. Another development in tattoo design that has gained prevalence in recent years is the tattooing of portraits. Because modern tattoo guns are so much more delicate and capable of intricate detail than the ones used years ago, artists are now able to do far more detailed work on the human skin. Talented tattoo artists can create tattoo portraits from photographs, movie stills and almost any sort of real life image. Pop culture figures from yesteryear such as John Wayne, Bela Lugosi (as Dracula, of course) and Marilyn Monroe are a few of the famous faces appearing in body art all over the world thanks to the efforts of talented tattoo artists. People also get portraits of family members tattooed. While cross tattoos are certainly traditional tattoo designs, consider many other religious symbols as well. Wiccans and other Neo-Pagans are fond of having pentagrams and unicursal hexagrams tattooed, for example, and some young Jews will tattoo the Star of David on their skin (this is ironic because it is technically against the Jewish religion to get a tattoo). 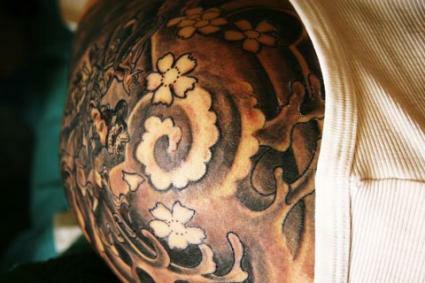 People will also get tattoos of social symbols which identify them as belonging to certain groups. If you're a political activist, get tattoos of the Democratic Donkey or Republican Elephant (although it is safe to assume there are less of the latter tats out there), for example, or if you are a member of gay and lesbian groups, tattoo the familiar pink triangle or rainbow symbol as a nod to your pride. Flowers including roses, orchids and tulips. Names of the deceased, people you love and family names. Dates that are important to you that you wish to carry with you visibly. Full sleeves that cover the entire arm, leg or neck in a single tattoo or several tattoos with background filler. Remember when you get a tattoo that it will be on your body for the rest of your life. Particularly when you get your first tattoo, consider the idea for a while before you sit down in the chair. If you have trouble coming up with a design, speak to a tattoo artist. These professionals can take your vague idea and transform it into something a bit more specific - and unique.